This is a recipe showing how I use put-up summer produce during the winter months when we are not receiving a weekly box from our Community Supported Agriculture (CSA) farm share. 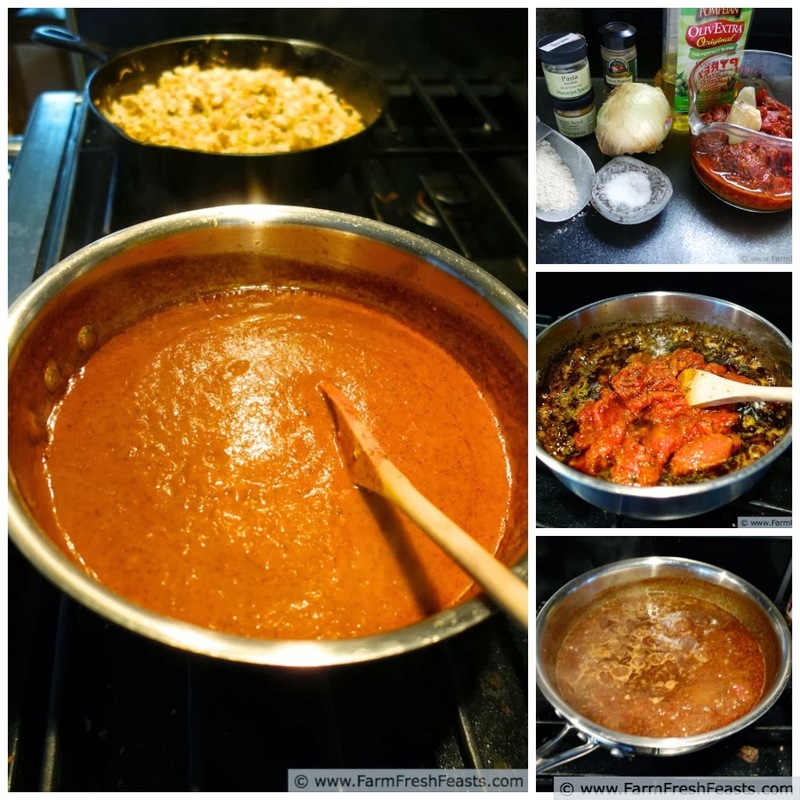 If you don't have a package of slow-roasted tomatoes in your freezer (link to Alanna's tutorial), please refer to Andrea's inspiring Easy Homemade Enchilada Sauce recipe below which uses canned tomato sauce. And put this idea in your back pocket--if you get a glut of tomatoes in the early fall (and have some room in the freezer) consider slow-roasting some. It's ridiculously simple and the end product is nearly as handy to use as the quarts of crushed tomatoes I've got in the pantry. I was going to share this recipe during the summer, because it calls for tomatoes and zucchini and I'm all about the seasonal eating, but it's here today for a couple of reasons. I'll list them, just for kicks. 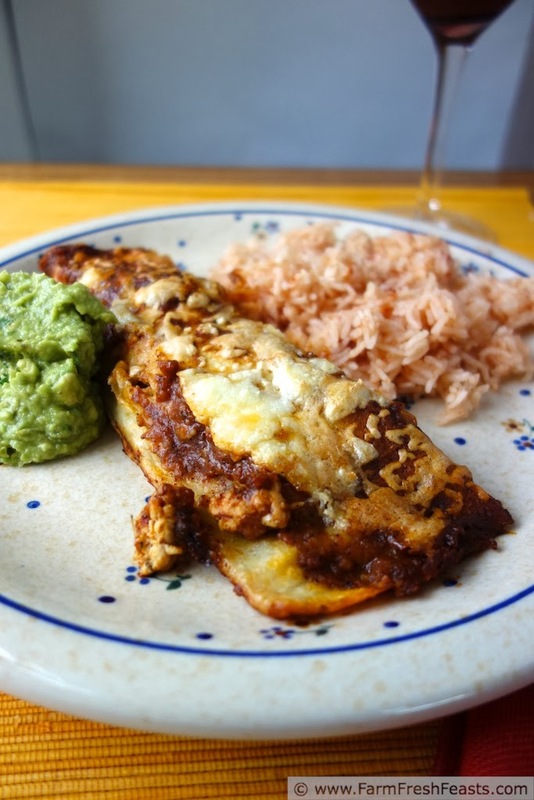 I've got a backlog of enchilada recipes (technically, 4) that I need to post, and there's no time like the present to start sharing them. I made a pan of Creamy Avocado Enchiladas today and it reminded me of these. I'm still reeling from the shock of posting a savory appetizer every day last week for #AppetizerWeek, and I realized I didn't have anything scheduled for today. 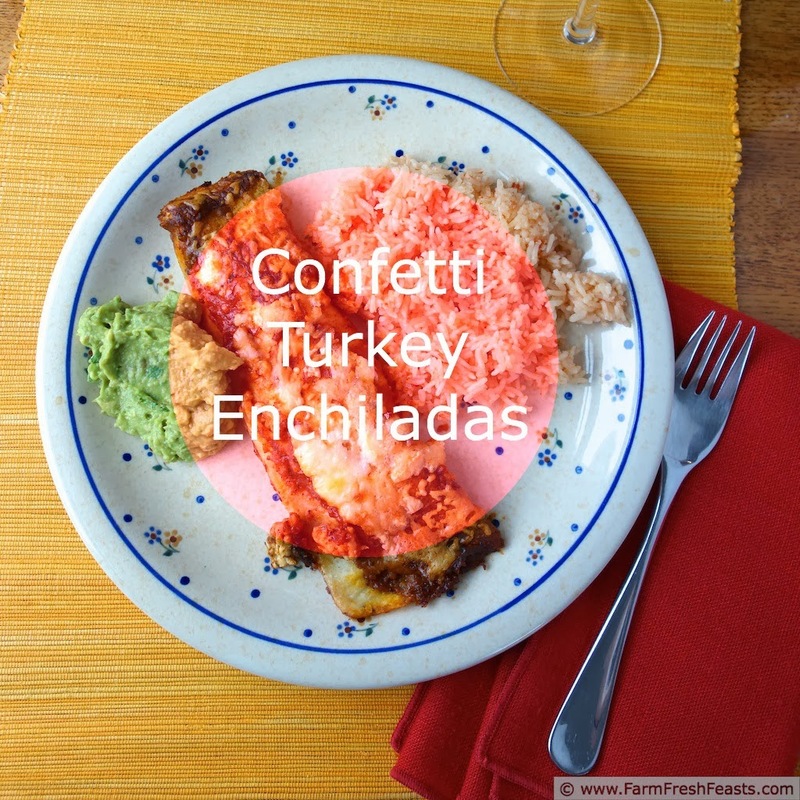 While my belly is full of Creamy Avocado Enchiladas, I bring you Confetti Turkey Enchiladas. 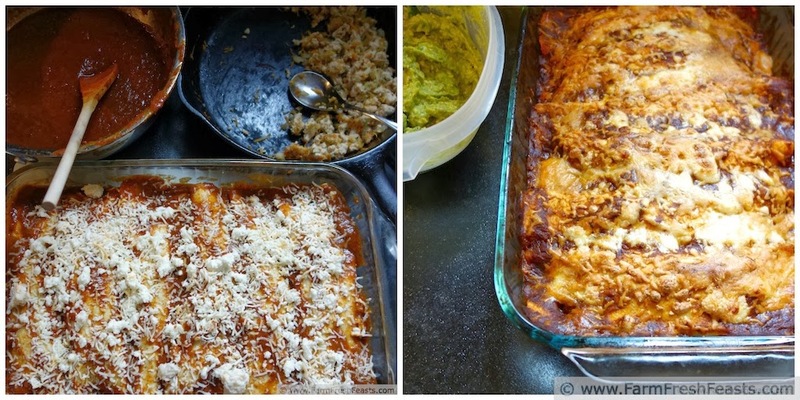 In fact, I've gone and made a Clickable Collage of Enchiladas. You can see it here. First Note: This recipe is in two parts-making the sauce first, and making the enchiladas once you've made the sauce. If you've got slow-roasted tomatoes it comes together fairly easily. If you don't have slow-roasted tomatoes use canned tomato sauce as Andrea does in her recipe linked below. Second (Slanty) NOTE: This recipe is not gluten free as written, because I used flour tortillas. To adapt this recipe for a gluten free diet please substitute the gluten free tortillas of your choice. For more recipes using carrots, please see my Carrot Recipes Collection. For more recipes using tomatoes, please see my Tomato Recipes Collection. For more recipes using zucchini, please see my Zucchini Recipes Collection. These collections are part of the Visual Recipe Index by Ingredient, a resource for folks like me eating seasonally from the farm share. I'm pinning more seasonal recipes to my Pinterest boards, follow me there. I'm sharing interesting articles and recipes on my Facebook page, follow me there. If you want to be like me and check out a curated peek of my life, follow me on Instagram. Want to know How To Use This Blog? 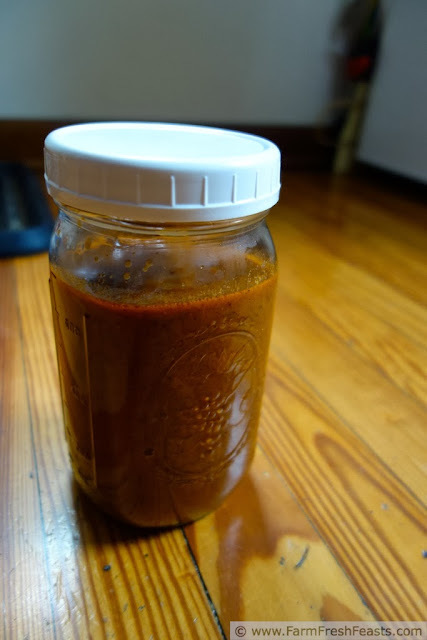 Refer to Andrea's Easy Homemade Enchilada sauce for instructions to make the sauce. Once the sauce is complete, puree it again with an immersion blender, then divide in half (you'll have about about 6 cups, total). You can freeze it in a quart size canning jar for up to 3 months. Lightly grease a 9 x 13 inch baking pan. In a blender, or with an immersion blender, puree the slow-roasted tomatoes. Refer to Andrea's Easy Homemade Enchilada sauce for instructions to make the sauce. Take the remaining half batch of sauce and spread ½ cup in the bottom of the prepared pan. In a large skillet over medium heat, sauté the turkey until lightly browned. Set aside. 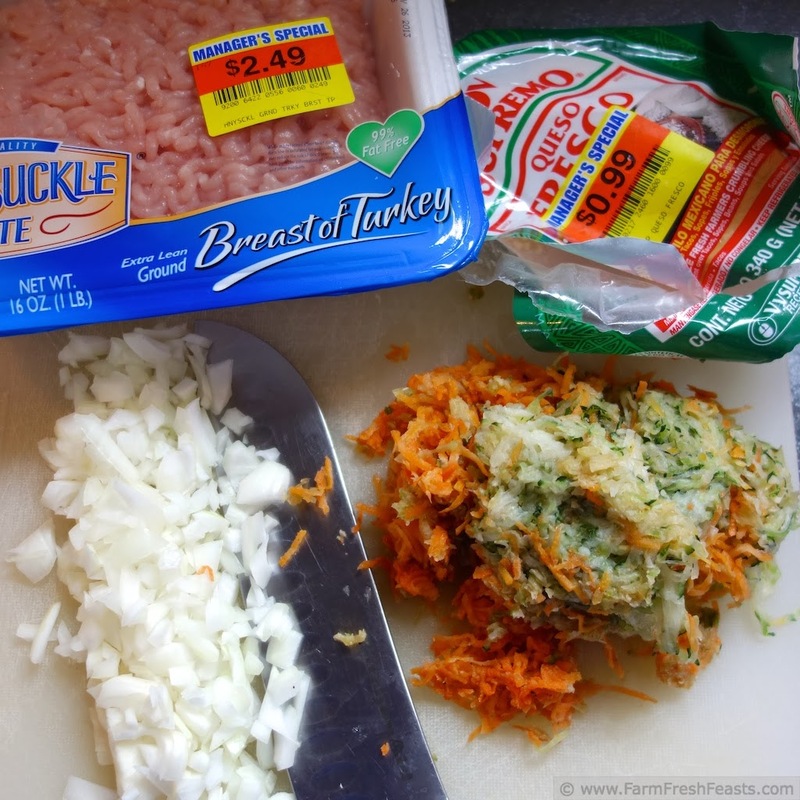 Add a turn of cooking oil and sauté the onion, zucchini, and carrot until softened, about 5-8 minutes. Add back in the turkey and stir to combine. Remove from heat. To assemble the enchiladas, spread 1 to 2 Tablespoons of sauce in the center of each tortilla. 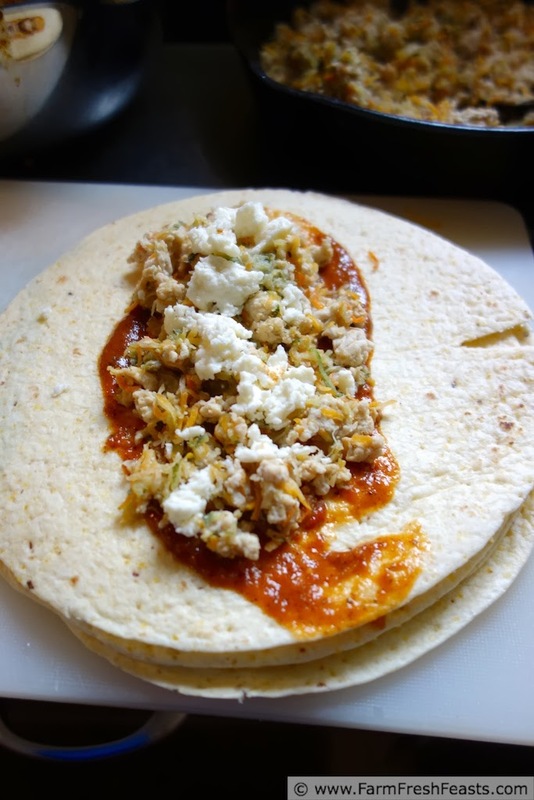 Top with about ¼ to ⅓ cup of meat mixture and a Tablespoon of crumbled queso fresco. Roll up and place into prepared pan, seam side down. Cover with the remainder of the sauce (about 1 cup) and the shredded cheese. Bake at 375 degrees for 25 minutes until cheese is melted, lightly browned, and bubbly. You may have leftover meat mixture--it's good for quick nachos. Yum. I love, love, love Enchiladas - especially with all these extra veggies! Enchiladas are a terrific way to get extra veggies into a meal. Great enchiladas know no season! I believe you are correct. Pizza has no season, enchiladas have no season. I'd say soup does have a season but I'm pretty sure as the Soup Chick you'd disagree. Veggies in the enchiladas are never a bad thing! I make my enchilada sauce with a thickened base of chicken stock and tomato paste. I'll have to give it a try with tomato sauce. I always used to use the can of sauce, and I'm amazed how easy it is to make. Mmmmm, enchiladas... I'll go for them any day or season! If only I didn't have to turn on the oven in the summer--I bet there's slow cooker enchiladas, though! You reminded me I still need to make the Squash and Caramelized Onion Enchiladas. So much delicious food, so little time. 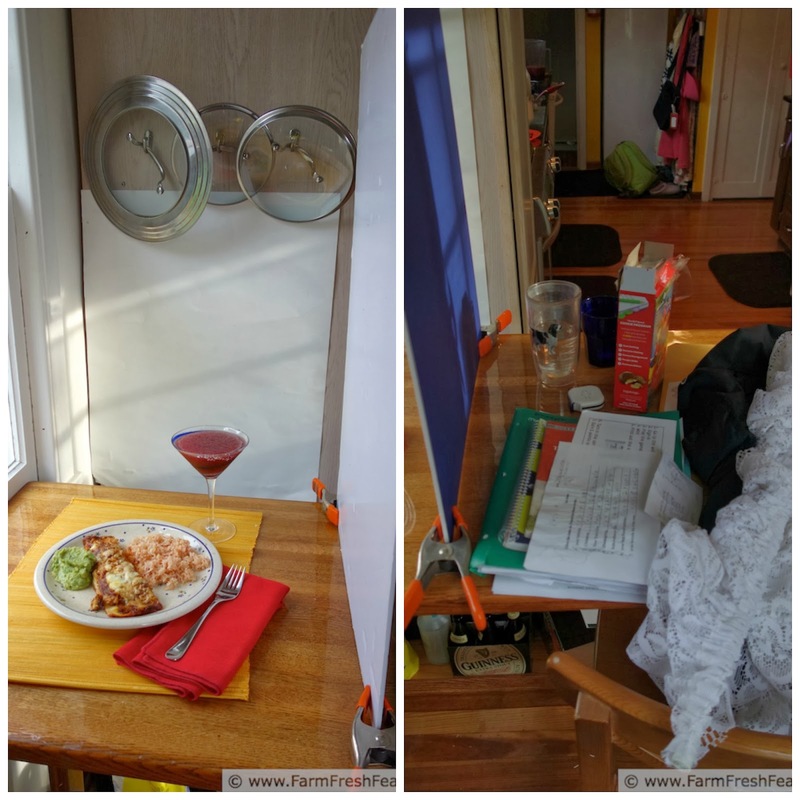 I love seeing the photo set up, especially that six pack of Guiness under the table. Yes, you need to make those enchiladas. So do I. Actually, I need to buy a bag of onions and make a crock pot of caramelized onions as I'm out. And thanks for reminding me of the messy floor--I'd've thought the messy table overshadowed it, but what the hey--it's Real.